History’s Corner – November 2017 | F.F.A.M. Since it is a beautiful Fall day here in Branson and I am on my back deck writing this article, I am reminded of another Fall day in the late 60’s when my travels took me to the small community of Doniphan for a class we called “Basic Firemanship.” This was a futile attempt to cram everything a community needed to know about firefighting into four classes that took three hours to complete on four consecutive evenings. This training effort was part of a circuit class that lasted a month. One class was taught in each community for four weeks, completing twelve hours of instruction per town. A couple of other towns that were involved in this circuit were Thayer and Alton. 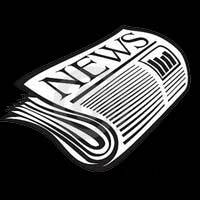 I wrote an article in the January/February 2013 newsletter about circuit classes. The first night of class covered the history of the fire service and the concept of water fog application. This class required a 35 mm slide projector and a 16 mm movie projector, which I am sure I put up and took down thousands of times in my teaching career. Since this was the only evening the students were subjected to a “sit down” lecture, short breaks had to be taken frequently or the entire room would be asleep! The remaining classes were mostly practical stuff outside like, hose evolutions, pumping operations, and practicing with ladders. These were great fun things to do on the square in a small town. We would always draw a crowd of interested citizens and kids. The fire station was a small single bay native rock building that sat a block off the square. I think it may have been built by the WPA and housed a single engine. The morning after this first class, I was to meet the fire chief downtown for coffee. His full time job was being a mechanic at the Ford garage, so we had to wait until ten so he could take his coffee break. Since Doniphan is the County Seat of Ripley County, the square included an epic historic two story red brick Courthouse built in 1899. Around the courthouse lawn there were concrete picnic style tables with checkerboards painted on the table surface. Old men playing checkers occupied several of the tables that morning. Old Glory was flying proudly over the Courthouse and was being moved gently by a fall breeze. This is what I have called for years, my “Norman Rockwell” experience. As the chief and I crossed the square to the coffee shop, we could hear band music in the distance, so we sat down at one of the concrete tables and watched as the high school band marched into the square to do a concert and show off their new band uniforms. This was true America in the 1960’s. All the shop keepers around the square came out of their places of business to watch the concert. I do not think a single door was locked or even closed. My point to this story, if there is one, is that most of those shop keepers and citizens that gathered were also at the fire class the night before. The bank president, the county sheriff, local Ace Hardware owner, the truck driver from the local lumberyard were all the people that made up the Doniphan Fire Department. Community minded folks who were willing to jump up from their Thanksgiving dinner table when the town siren started to sound to go to their neighbors house fire or their pasture burning. AND WHAT ABOUT PEOPLE TODAY? Fortunately, all across Missouri and our Nation, these same type of people still stand ready to do the same thing the folks in Doniphan did in the 1960’s. Most of them are volunteers or paid on call. In more populated municipal and urban sections, career firefighters provide emergency services and we all stand together a brotherhood called the American Fire Service. I wanted to feature a few of these folks in this article. 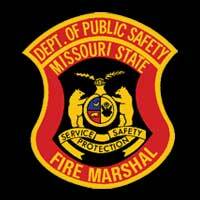 My epic source at the Fire Marshals office tells me there are estimated 25,000 firefighters in the State of Missouri and almost nine hundred organized fire and rescue agencies. Of that 25,000 number, 80 % are volunteer’s. The reason these numbers are approximated is because not all fire departments elect to follow the law and register with the State Fire Marshal’s office as required by RSMo 320.277. This statute requires annual registration. My thought is that all departments should stand up and be counted. There is power in numbers. In the September/October 2016 issue of the newsletter my article featured Dr. Jim Coleberd. In the article I pointed out that he was unique in that his title was “Doctor” because he served for decades as an emergency room physician. He was also known as “Chief” because of his fire career as the Fire Chief of the Clinton Fire Department. At the time, it did not register with me that I have another life long friend who can also use the title “Doctor/Chief”. Bill and Carol Jones have spent what most people would consider a lifetime together and have shared the passion for the fire service that many couples do in our state. Carol recently told me that one of her greatest joys in life come from teaching fire and life safety classes for Cub Scouts in her community. 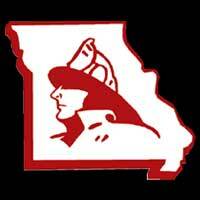 She has also served as the President of the Ladies Auxiliary of the Fire Fighters Association of Missouri in 1979. 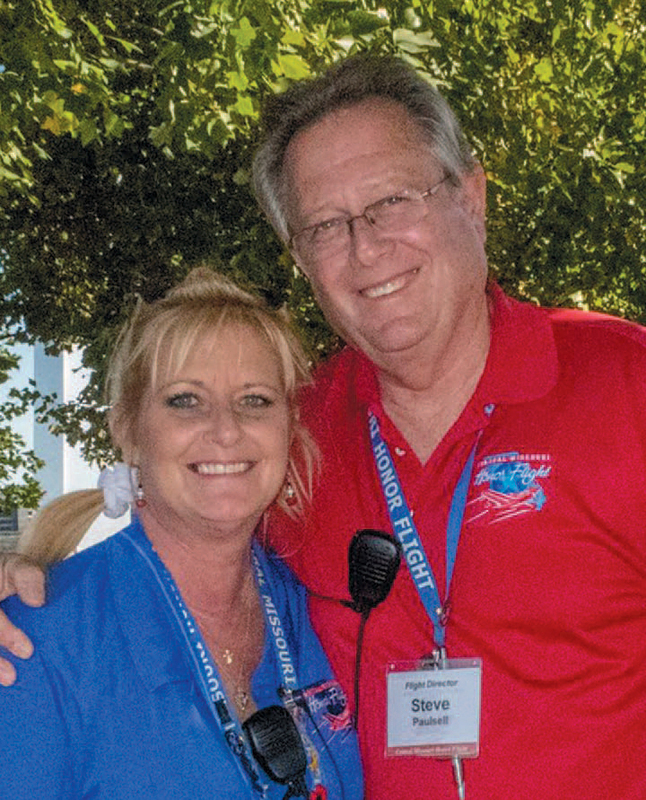 Bill and Carol started on their fire adventure when Bill became a member of the Boone County Fire District while attending Vet school at the University of Missouri-Columbia. Carol was also a member of their ladies group when their bright yellow uniforms were all the rage! 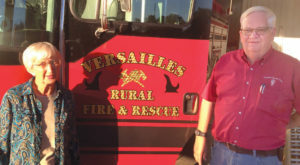 Versailles Rural Fire District Chief, Dr. Bill Jones and his wife Carol Jones. 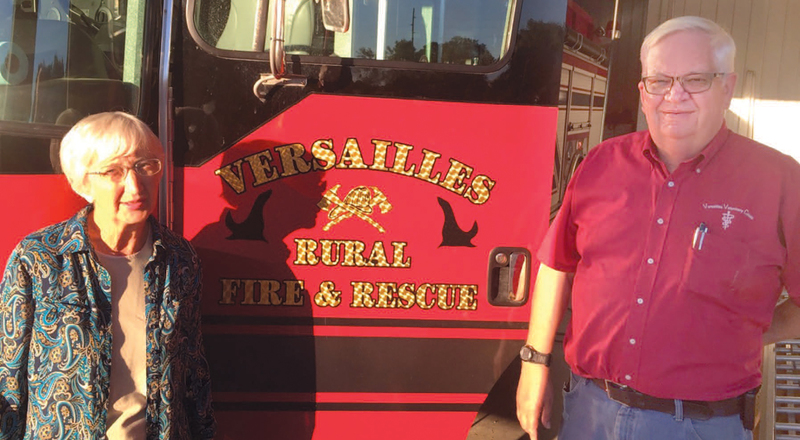 Bill has served as the Fire Chief of the Versailles Rural Fire District while also operating one of the most successful Vet Clinics in the state. Since the inception of MO Task Force 1, Chief/Doctor Bill has deployed with the task force to care for the many canine members that are used in search and rescue operations. Versailles is one of the only departments in the state that actually has a large animal rescue unit as part of their equipment. And if that’s not enough stuff to do, he also serves as the Morgan County Coroner. This is the kind of dedication that keeps the wheels turning in communities across Missouri. Chief Steve Paulsell started his career in the fire industry as a Volunteer with the Boone County Fire Protection District in Columbia in the early seventies. He was a local and had graduated from Hickman High School when he became a member. It didn’t take long for the fire service bug to bite him and he was hooked for life. After Boone County made the radical change from a membership funded fire department to a fire protection district in July of 1970, things began to change rapidly. We were developing stations in the small towns of Harrisburg, Hallsville and Sturgeon and the need for at least one full time employee became oblivious. Steve became that full time employee and functioned in the capacity of vehicle and facilities maintenance supervisor and anything else that was needed doing for a number of years. Since I was the fire chief and on the road for the University a lot of the time, Steve was promoted to the title of deputy chief and served in that capacity until he was appointed the fire chief in 1977. 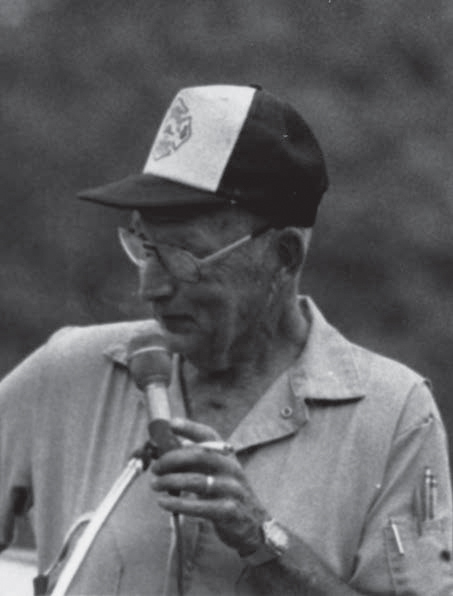 His devotion to the organization over nearly forty years is legendary. The formation of nationally recognized wildland firefighting teams as well as the MO-TF1 federal Urban Search and Rescue Team based at Boone County are only a few of the many accomplishments of the district under Chief Paulsell’s leadership. Both he and Sharon made a positive mark on the organization, which should and is recognized by every citizen of Boone County. Steve retired from the district in November of 2008. Both he and Sharon have proven since then that when you have a drive to care for your fellow man, you keep doing it your entire life. They are both now involved in their new passion of transporting America’s veterans to Washington D.C. to visit memorials dedicated to honor their service and sacrifices. The Central Missouri Honor Flight organization completed their 49th flight October 2, and is making all the arrangements for their 50th soon. Since it’s inception in 2009, they have transported over 2,800 veterans to Washington D.C. Top priority is given to senior veterans from World War II survivors, along with other veterans of Korea and Vietnam. This is truly a labor of love for Steve, Sharon and all the other volunteers who make these flights possible. For over forty years Ken Hoover has been the driving force behind the Little Dixie Fire Protection District in the Mexico, Missouri, area. 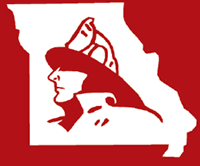 Little Dixie Fire District was formed by a vote of the taxpayers in Audrain County in 1974. Prior to the formation of the district, the Mexico Rural Fire Association provided fire protection. By 1978 the district had constructed its headquarters station, with station two following in 1993 and station three in 2001. Over fifty volunteers staff the district along with a very active group of cadets. Chief Hoover is very proud of aggressive training program and considers all his members to be part of his extended family. 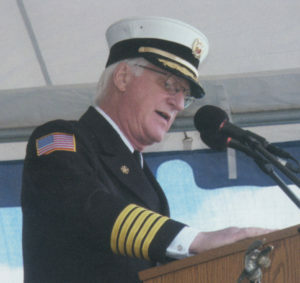 Along with his responsibilities as Fire Chief, he is an ordained minister and serves as the President of the Fire Fighters Association of Missouri. He spends an exceptional amount of time, traveling to all corners of the state, attending fire functions and promoting the association. Dedication should really be his middle name. When anyone has a conversation about the Firefighters Association of Missouri, it does not take long for Joe Jackson’s name to come up. He spent most of his adult life dedicating time and money to the organization. Joe was the second President of the association, being elected for three terms between 1961 and 1967. 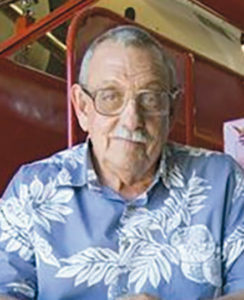 He was a regular at the State Fair Fire Department as the crew chief of the racetrack. Since Joe was also in the fire equipment business, he would show up with his pickup loaded with his own fire extinguishers to use for the racetrack fire protection. In 1961 the fair activity the association operated was a fire prevention tent, not a fire department. Chief Jackson and Chief Bill Steiner from O’Fallon were the ramrods of this early public fire education effort. Most people in the FFAM believed as I did, that Joe Jackson and Phil Sayer were joined at the hip. Joe and Phil traveled together to hundreds of fire meetings around the country, as well as working the racetrack fire and rescue detail at the Missouri State Fair. Another very close associate of Phil’s was John Wilson from Houston, Missouri. The two of them were known around the state as the true experts in farm equipment and bus rescue/extrication. Jointly, they put together the entire training program for the University of Missouri Fire and Rescue Training Institute on these subjects and delivered most of the training programs. Phil was no stranger to heavy equipment since he and his family operated one of the largest farming operations in Northwest Missouri. Previous articles in the newsletter feature additional information about both of these outstanding individuals. One of my greatest joys in life is to be able to call both of them “friends” and I miss them daily. John was a dedicated instructor and worked for us full time as a vehicle extrication instructor at MU FRTI after his retirement as a federal firefighter at Fort Leonard Wood. 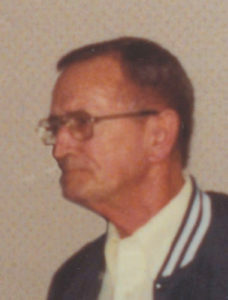 He and his wife, Velma were active in the FFAM. The work related stories as well as fishing trip tales I could tell about him and our relationship could fill and entire book. The November/December 2015 issue of the newsletter has an article about both these incredible guys. Read it to find out more. One of the first times I had an opportunity to work with Louie was in the was an evening circuit fire training class I was teaching for Fire Service Training in the historic fire station that sits on top of one of the many hills after you cross the river bridge into Hermann. It seems to me now that the class was a half century ago but I do not care to do the math! The second floor meeting room was sort of’ stuffy so we went out to the shoe factory parking lot and did some hose evolutions and pumped some water. Hands-on stuff was always a better class than being inside anyway. And yes, there were actually factories that employed people in small towns in Missouri then and they actually made shoes! Later in life, I had the joy of working with Louie at the MU Fire and Rescue Training Institute and he could normally be found, as he is in the above photo, dressed in a pair of gold colored coveralls with the words “Missouri State Fire School” stitched across the back. He did everything for us, including delivering props to sites for regional fire schools to maintaining equipment and of course teaching. 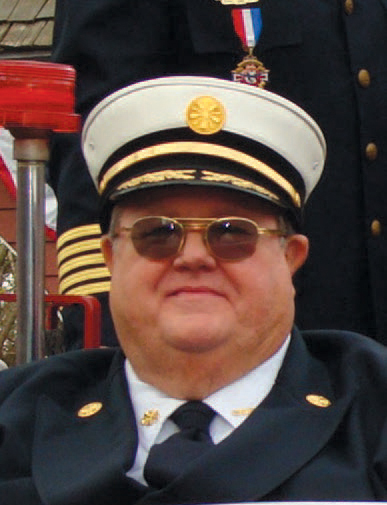 Another of his passions was fire investigation and he was employed in the early days of the State Fire Marshal’s office as an fire investigator. He was an all round good guy and a great friend. One of the first times I can recall visiting with Art Smith at any length was at a Regional Fire School in Lewistown. We had this bright idea that State Training agencies from adjoining state could co-sponsor regional fire schools. At the time both state training directors in Illinois and Iowa were good friends of mine so we gave it a shot. The concept was sound because we could use resources and instructors from all three states and draw students from all three. As I recall we overdid it slightly and ended up with more staff than students. 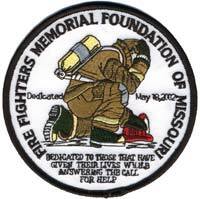 Art was a huge supporter of training and equally excited about the Fire Fighters Association of Missouri. He was also in the fire equipment business at the time and was at the school with a booth. 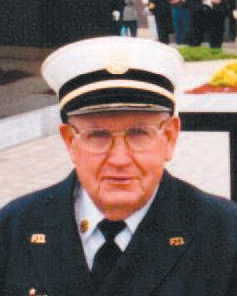 After being in North Missouri for years his family moved to Audrain County and he became involved in the Little Dixie Fire District where Chief Hoover enlisted him into the ranks of the group of people responsible for the Firefighters Memorial. Art was never known as a person who would do stuff half way and he put his heart and sole into this project. Chief Smith was the President of the FFAM in the late 1970’s and assisted with fire schools and training every chance he could. He was another one of the good guys! His son Keith continues that family tradition as a member of the Wright City Fire Protection District and an active member of the FFAM. Keith was the President of the FFAM during the Golden anniversary year of the organization in 2004. 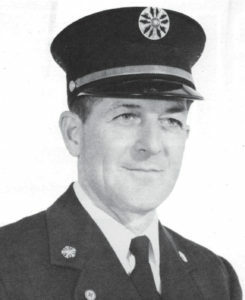 Chief Bob Morrison provided leadership in the Lees Summit Fire Department for a number of years before being appointed as the very first State Fire Marshal for the State of Missouri The Fire Marshal’s office was established in 1972 by the 76th General Assembly following extensive advocacy efforts by the Fire Fighters Association of Missouri and other organizations. Senate bill 487 provided for the hiring of a fire marshal, a deputy, four investigators and a secretary. Fire Marshal Morrison employed Richard “Smokey” Dyer as the Deputy and Louie Gray was one of the field investigators. The other three were Tom Behrandsen from the Liberty Fire Department; Jack Caparoon from the Kansas City Fire Department and Richard Lehmann from the Independence Fire Department. Chief Morrison also provided leadership to the FFAM. 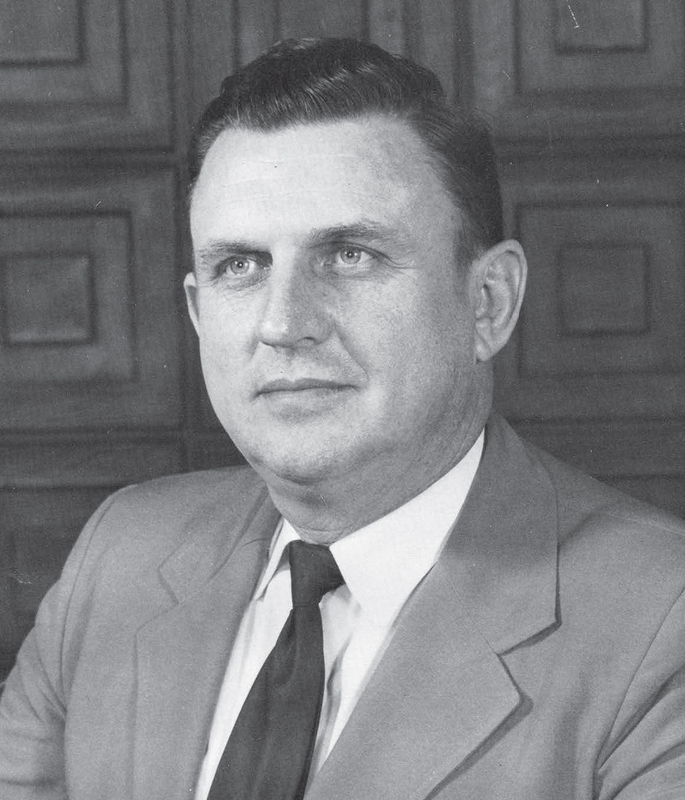 He served as President of the organization in 1977 and 78. 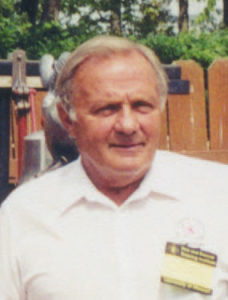 Bob was another one of the originators of the Missouri State Fair Fire Department, serving as a Commissioner and spending a number of years working for it’s improvement. This is just a hand full of individuals that I think all represent the masses of folks in our state that have had and will continue to have a positive impact on the protection of the citizens of Missouri. Yesterday, Sunday, October 15, was a shocking day for me and for hundreds of fire service associates across our country. The news started to surface on social media late afternoon that retired Phoenix Fire Chief Alan Brunacini had answered his final alarm. Our friendship started when we were both students in the School of Fire Protection at Oklahoma State University in the early 1960’s. I was a not quite dry behind the ears kid from O’Fallon, Missouri, and he was a Lieutenant from a large metro fire department on leave from Phoenix to receive a degree. Even then just having a conversation with him was a learning experience. One of my favorite “Bruno” stories resulted from a fire call the Stillwater Fire Department made to a “downtown” alarm one summer afternoon. Keep in mind that this is 1960. Equipment from the campus fire station was Engine 37 and Ladder 38. Alan and his friend Jim Lett were in the station working out and lifting weights. I was on duty and assigned to the ladder. Since we were always short of help in the summer, Jim and Alan, “caught the back step” of Engine 37, with gear thrown onto the canvas hose load cover. Ladder 38 followed Engine 37 to the alarm so I had a clear view of the back of Engine 37. About a block from the station, the draw- string on Bruno’s sweat pants failed and he rode the remainder of the call thru Stillwater with his sweat pants down around the tops of his pull up boots. Needless to say, anytime I had an opportunity to introduce him in the following years at speaking engagements, that story would surface. He was a great asset to us here in Missouri. His class would always be filled in recent years when he taught at Winter Fire School.